PLEASE NOTE: I have two blog posts today... please check them both out! Thank you!!! 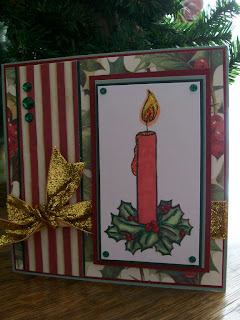 Theme: NEW - anything that is NEW - new products, new techniques, try something new, New Year's card. What's new? 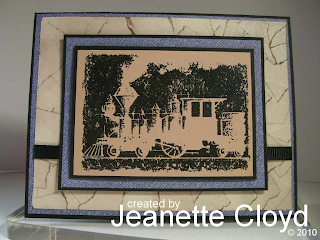 I used a new Stamp-n-Doodle image for the first time. I used a new layout, letting the awesome image shine. I used a new color scheme that I'm really loving! 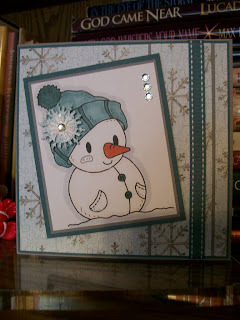 And perhaps the most unusual for me (though not totally unheard of) - I DIDN'T USE ANY DESIGNER PAPER! What will you create with the NEW theme??? 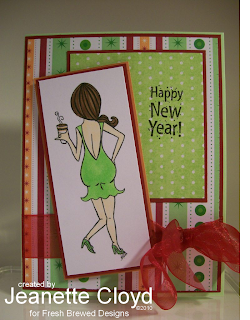 Fresh Brewed Designs is Celebrating a New Year! WOW! Can you believe it? Christmas is now history! It sure was fun! I enjoyed a wee small break from blogging during the holiday, too. Did you miss me? I missed all of you... and am deligted to be back posting to my blog again! 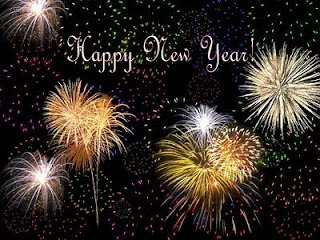 Soon - very VERY soon - we will be wishing each other a HAPPY NEW YEAR! Therefore, this weeks Freshed Brewed Designs Challenge is a very fitting one. 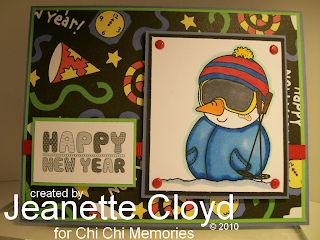 Theme: Celebrate - Happy New Year!!! This image originally was a Fresh Brewed Designs digital image, but is now available as a Fresh Brewed Designs rubber stamp. And it's currently on sale! Many of us are traveling this holiday weekend, on our way to visit family and friends. Therefore I think it is fitting to post this travel-themed card that I created for the Sisterhood Swap on SCS (it's all about one of my favoirite color schemes - black, tan, and blue). Wherever you go, whatever you do this holiday season, may it be a HAPPY one for you! 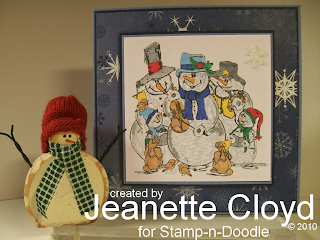 Stamp-n-Doodle Challenges usually last one week, but due to Christmas, the current challenge actually continues for this week, too. That means you still have time to participate! 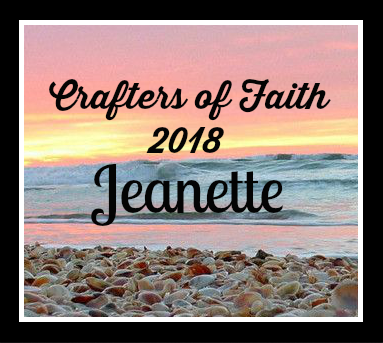 I do not have a creation for you today, since I've been so busy lately... something about Christmas getting in the way of my crafting time. LOL! Instead I'd like to share with you some pictures of a very special gift I received. The Sisterhood group on SCS did a Secret Santa exchange again this year and we had our opening on Monday. My package actually arrived about a week before, all the way from GERMANY!!! I knew what that meant... it meant Tanja was my Secret Santa. But I didn't peek early; in fact, I was late to the opening of the gifts party so kept my sistahs waiting to see what I'd received. I have many online friends - many who are part of the forest swaps that I host on Splitcoast Stampers. Out of that group, an idea was formed to create a challenge swap. Every two months there is a new round. The hostess for the round sends images and/or an extra something to the other participants. 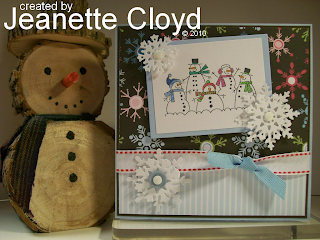 This means that everyone creates with the same image/item, but uses her own papers, embellishments, and creativity to come up with a standard sized card. April was the hostess for this round and she gifted us with the cutest image. Easily recognizable as a TGF image, the cutie is Anya in the Spotlight. 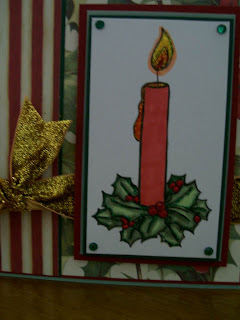 April also sent each participant a small roll of decorative tape to use on our cards. I wasn't sure how much tape was on that roll, and since I had to make four cards (it's a 3 + 1 swap), I went with a minimal amound of the tape ont he block of Crumb Cake paper that is directly behind the image. 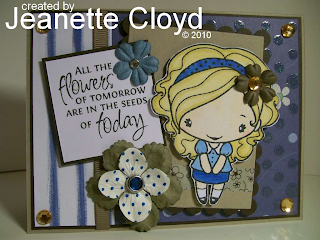 I added lots of bling - rhinestones - and prima flowers as well as a Verve sentiment. Another forest friend, Kelly, actually gave me the sentiment stamp. I absolutely love it! Thank you, April, for a fun round! I am so excited because soon these cards will be swapped... and we'll receive the image from Gael who will serve as our February hostess. I always look forward to the Sunday before Christmas with great anticipation. This year was no exception. It actually begins day, weeks, sometimes even months before that Sunday. The planning, the shopping for supplies, the creating. Perhaps I should tell you my story. The first year my husband and I were married, I had no idea what to expect. We met while attending seminary and married a few months later. The Sunday following our brief honeymoon, my husband (who was still a full-time seminary student) took a new pastorate (his second, but my first as a pastor's wife) of a small church in northern Missouri. Our congregation accepted us and nurtured us, for which we are both grateful. The Sunday before Christmas the families in our congregation showered us with many gifts. We were overwhelmed by their love and generosity. I vividly remember the first year's gifts... I canned a variety of pickles and each family got to select a jar to take home with them. 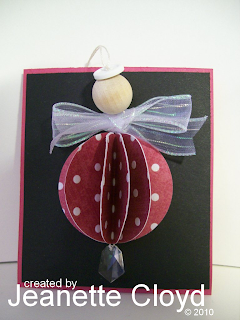 More times than not, though, the gift is a Christmas ornament that I've made, usually an angel. We have been in our current church for eleven Christmases now and every year they have received an angel ornament. I think if I tried venturing from that tradition at this point, some of them might question my decision. LOL! It isn't an ordinary pouch, though. It holds something very special. My husband has learned that he loves writing poetry and telling stories. He's actually part of a storytelling group. He has even been known to write a poem for funerals and other events. Our church members love it when he does that. In fact, one lady has even told him when she dies he HAS to write a poem for her funeral. LOL! So I asked him to write a poem to be included in this year's angel. He readily agreed to do so. With my husband's permission, I'm sharing his poem with you, too. The gifts we wish for ourselves? Stockings stuffed with goodies clear to the toes? The smell of bread baking rising with yeast? But about a miraculous baby that was born. Who came to Bethlehem pregnant with life. Shelter was found in a cattle pen. 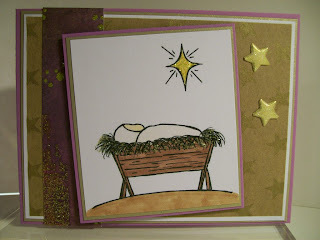 In that stable she experienced labor. Christ arrived our salvation to assure. Were startled by a glorious light. Came proclaiming this event of cheer. A king, a savior, who would bring joy. From our sins to bring release. Then left with excitement to tell his story. But about the Christ who saves us from our flaws. Merry Christmas! May the season hold many great joys for each and every one of you! Sunday's are special - for many reasons. 1. I have the opportunity to go to church for worship! 2. It is a relaxing day in which I do very little work. 3. The Crafty Ho Challenge begins. 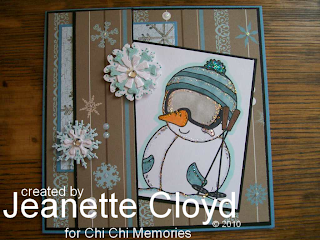 This week's Crafty Ho Challenge is a sketch challenge. Those of you who know me may wonder at the image I used. After all, there isn't an athletic bone in my body, nor do I watch sports. Have I gone nuts?!?!? No, not really. 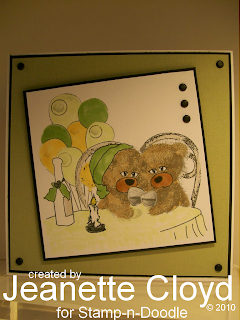 I actually purchased this image from Bugaboo Stamps some time ago to create a card for my chemo buddy at that time. She was a big hockey fan. And I think it's such a fun image. 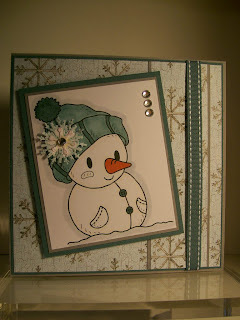 Besides, I thought maybe it would be refreshing to step away from snowmen and Christmas images for a change of scenery. Enjoy your Sunday! And be sure to stop back by tomorrow to see something rather unusual here on my blog. This is the week for Chi Chi Memories new challenge... which means I was supposed to post a card based on the challenge sketch to my blog on Thursday. However, Thursday was a challenge, in and of itself. I didn't have Internet! UGH! In fact, our internet server was down for three days this week. DOUBLE UGH! I now have a new best friend! He's the internet repairman! I ♥ him!!! The challenge doesn't end until December 29 to play along! And remember, you can use any stamps to play along, but you MUST use CHI CHI MEMORIES images to be eligible for the PRIZE. Let me also remind you that Chi Chi Memories is having a DT Call! Sooooooooooo... apply! This is a bittersweet post for me. 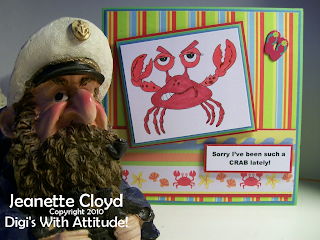 It is the last time I will be posting a card as a member of the Digi's With Attitude! design team. The time has gone by so quickly. It only seems like yesterday that Cindy-Lynn emailed me, inviting me to be one of her design team members. And now here it is! The very last week. THANK YOU, Cindy-Lynn!!! It has been such a pleasure creating with so many cute and sometimes sassy images! I appreciate the honor of being on your very first design team! 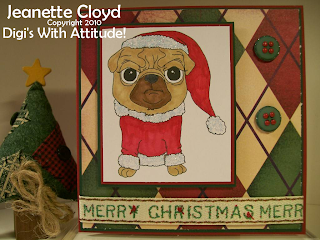 The design team was given the Pugly Santa image to create with this week. You will want to check out the Digi's With Attitude! newest family of images, too.... TWEENS WITH ATTITUDE! These are going to be a lot of fun! NOTE: I have two blog posts today, so be sure to check out the one that follows this one, too. It's a Fresh Brewed Challenge and tells you how to get a free image! This is December 15.... which means it is time for another DUEL! The Dueling Darlings were hosted this month by Terry and Laura Jean. 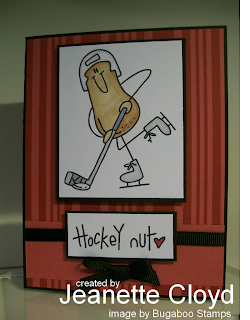 They chose the theme "My Favorite Things" and challenged us to not only create a card with their marvelous kits, but also to post a few things that make us happy. Before I show you my card, I'll tell you just a few - a very few - of my favorite things. I ♥ My computer - and the Internet (when it works!) hmph! Our internet was down the past two days so I'm really glad it's back! That's why this post is so late today. I'm sorry! I hate letting the Dueling Darlings down! 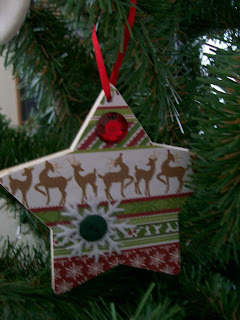 I ♥ Christmas trees/decorations - lots and lots of them! I ♥ My Hideout - because that's where all my "toys" are! I ♥ My car - because I love to go places! 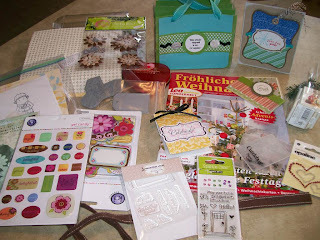 And I ♥ the Kit Terry sent to all the Dazzlers this month! You should see it! WOW!!! Such fun! 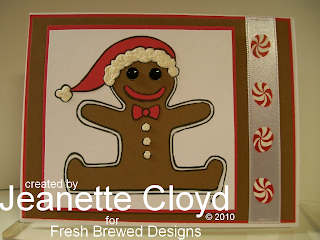 I used a paper-piecing technique to create my card by simply printing the Fresh Brewed Designs Gingerbread Boy image on white, brown, and red cardstock and cutting the appropriate elements for the finished image. I used Liquid Applique for the frosting elements on the Gingerbread Boy image because I like the way it puffs when heated with a heat gun. I hope you'll participate in the challenge! 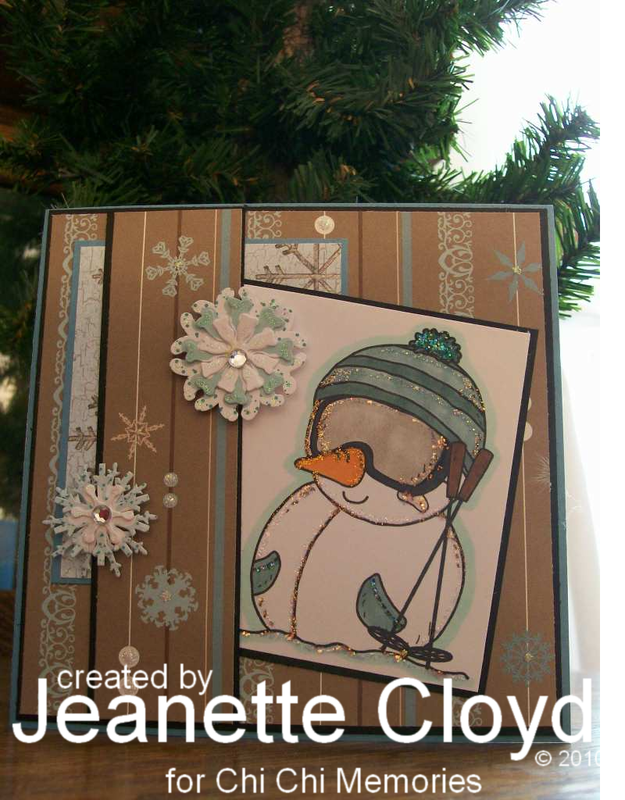 Be sure to check out the Fresh Brewed Designs Challenge Blog soon because Heather's giving everyone a really cute FREE digi image, but the offer is ends at midnight on Friday (December 17). You won't want to miss it. I guess it's time to bundle up and build a cute snowman! who said Love the colors and the festive attitude. Congratulations, Lisa! Please send an email to Cindy-Lynn (the owner of Digi's With Attitude!) dwacblog@live.com and she'll get you your prize. Also... Don't forget to get your applications in for the Digi's With Attitude Design Team. The deadline is December 27. 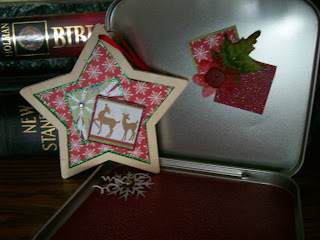 This week's Crafty Ho Challenge is RED and GREEN! I love a good challenge... and Chi Chi Memories has some good challenges! 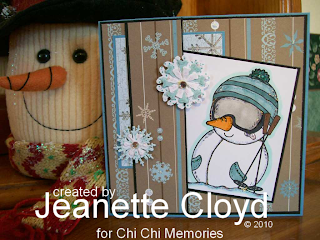 I used one of the December images from Chi Chi Memories, a cute little snowman! Looks like he's ready to go skiing! brrrrr!!! It's sure cold outside! Don't you just love Chi Chi Memories images? I know I do! Speaking of Chi Chi Memories... did you know they are having a DT Call? There's still a little bit of time to apply, so rush to the blog to get all the details... and send in your application! 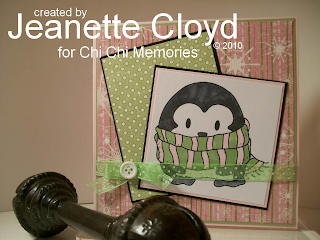 You might also like to know that Chi Chi Memories is on Paper Craft Planet. Check it out! If you're on Facebook, be sure to check out the Chi Chi Memories page there, too. There are lots of awesome pictures!!! Chi Chi Memories is on FlickR, too. WOW! They can be found everywhere!!! Okay, scoot... you know you want to get out of here and check out all of these awesome sites! Have fun! This week's Digi's With Attitude! Challenge is going to be so much fun! After all, digital images are certainly gaining popularity. Who doesn't have a few of these saved somewhere on their computer. So certainly there will be a lot of activity in the challenge. If you haven't yet tried a digi, let me suggest that you do so ......... soon! This week's Stamp-n-Doodle Challenge is a unique one! 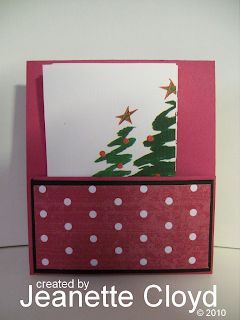 Instead of making cards this week, participants are asked to make a Christmas gift, box, or bag. To get things started, the design team made elf shoes. My elf shoe was made with a piece of golden cardstock. 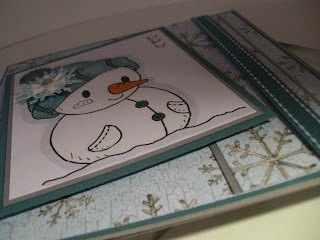 After cutting and assembling it, I wasn't very happy with the color, so I sponged some Stampin' UP! Cherry Cobbler ink all over it. Then I sponged Early Espresso ink onto the edges to give it some dimension. 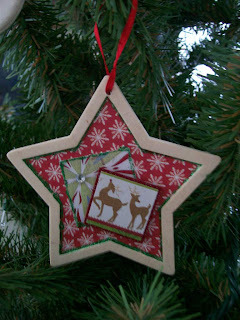 For embellishment, I added a piece of Christmas fabric ribbon and two large buttons. To complete the look, I filled it with sprigs of artificial greenery. I love things that sparkle and shine, don't you? Diamonds are a girl's best friend!!! 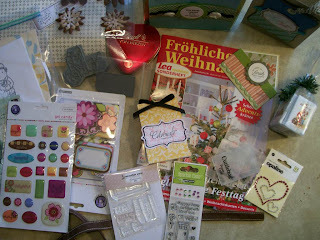 Fresh Brewed Designs is having a SPARKLE and SHINE Challenge this week! It has lots of sparkle and shine, thanks to Stickles glitter glue, faceted rhinestones, and dazzling ribbon. It's that time of year.... shopping, Shopping, SHOPPING! Sandy Claws Is Coming to Town! I have great news to share with you today! First, I want to tell you about a great new challenge blog that's going to be starting after the first of the year. 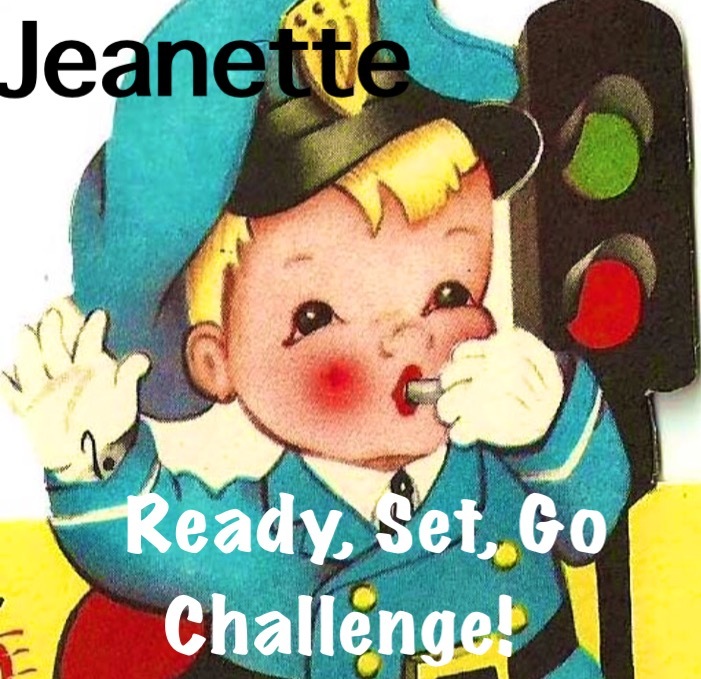 Jeri, an online friend of mine, has taken the plunge and is opening this challenge blog. She's awesome!!! You will definitely want to become a follower, and you will want to participate often! Who knows, you might even like to apply for her DT! I know I'm going to apply... wish me luck! Now, if that isn't enough exciting news, I have more... Santa Claus is coming to town! 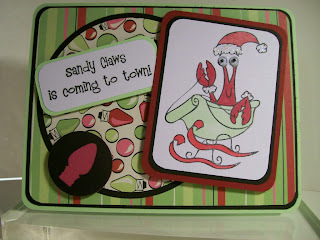 or, in the words of my card, Sandy Claws is coming to town! Have you been naughty of nice??? 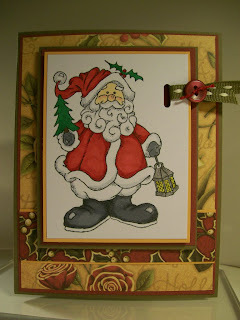 I made this card for Barb's Santa Claus swap. She is such an incredible hostess! Thanks, Barb!!! 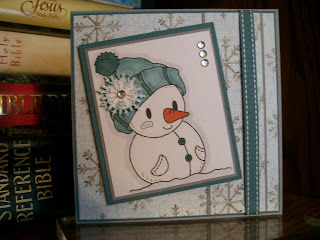 Note: I have two posts today... this one and a Crafty Ho Challenge card that can be found in the next post. The first Sunday of each month, the five of us kittens create something special for you. Kelly was our hostess this month and me-oh-my! I wish you could have seen the kit she sent us. 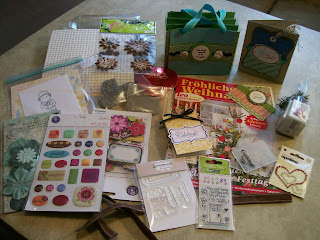 It was over-the-top creative, fun, and brimming with goodies!!! She challenged us to think creatively - no cards this month. No! 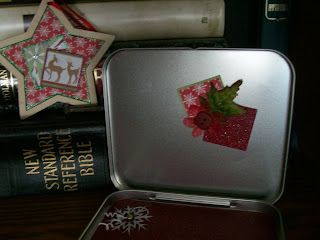 We are making gift tins with an ornament inside. How fun is that?!?!?!? Now, before you look at my pictures, let me make this disclaimer... this is the FIRST time I've ever tried doing anything like this before. It was not easy and I really did try my best. I'm sure the other kittens will wonder about that... and I'm sure their's are much more creative than mine... but I had SO MUCH FUN with this project, even if it isn't as creative as it should be. Here are just some of the supplies Kelly sent our way (which were used in this presentation): designer papers (My Mind's Eye, DCWV, etc), Stampin' UP! buttons, glitter glue, rhinestones, glitter brads, felt snowflakes, poinsettia flowers, and of course the tin container and wooden star ornament. 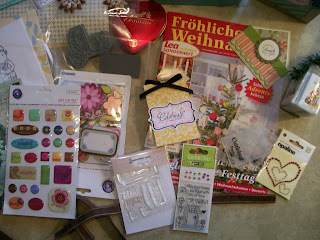 I added a little bit of cardstock (Stampin' UP! 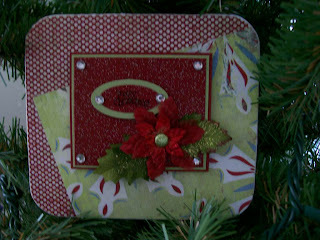 Cherry Cobbler and Pear Pizzazz) and used a sentiment of Merry Christmas, stamped with Versafine Onyx Black. Did you know? Have you heard? 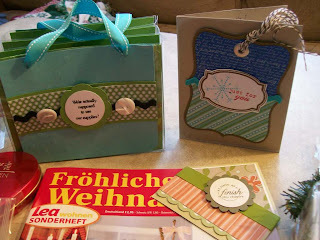 Fresh Brewed Designs hosts a challenge every Friday on Paper Craft Planet! Isn't that great?!?!? This is the third week and oh my! There's even a prize to be won by one lucky crafter! So rush on over and check out the details here! Play along! It's going to be fun!!! 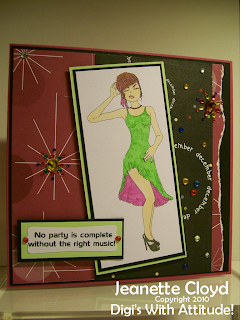 All you have to do is create a new card this week using a Fresh Brewed Designs and BLING. As much or as little as YOUR HEART desires. This time of year, BLING is easy and oh-so seasonal!!! Seeing this Fresh Brewed Designs image makes me want to sing... or at least hum a tune! Jesus IS the reason for this wonderful Season we are enjoying! Let's celebrate the birth of our Lord and King! 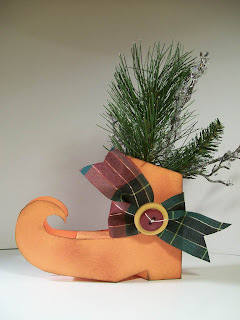 Welcome to the very first Combined Design Team Office Party Blog Hop! 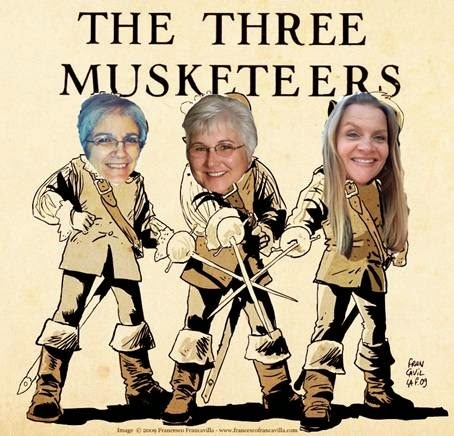 If you've been hopping along, you should have arrived here from Tazza's blog. If you just happened to get here (because you love my blog) then go back to the beginning and hop along. You'll be glad you did. We all worked really hard this year and wanted to have some fun, so time for a truly unique Blog Hop! Our theme is Office Party and oh what fun this will be! 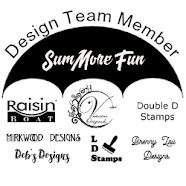 We Teamed up with Digi's with Attitude / Drunken Stampers to give you a wonderful time.. with so many chances to win and so much inspiration to see your sure to have a good time! All Prizes have Attitude that much is for sure, see what you could win at the Digi's with Attitude! Store Total Prizes worth a whopping $115.00!!!! Who needs more?? Now to find out all the details... so you too can score! 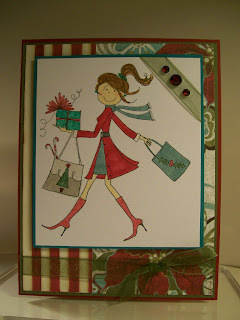 As we're mingling at the office party (blog hopping) with the fabulous gals from Digi’s with Attitude & Drunken’ Stampers be sure to leave comments along the way!! 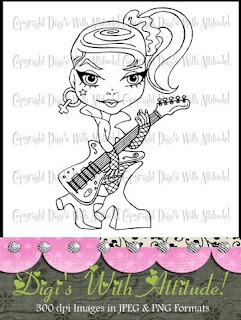 Each designer will draw from the comments left on their blog and one winner will receive the digi that was used on that designer's blog post as well as a $5 gift certificate to the Digi's with Attitude store! How cool is that???! You can enter more than once with a new card but no duplicates, your post must be a new as of December 3, 2010... Non-eligible entries will be removed. The Digi’s With Attitude! 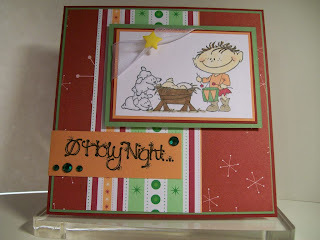 Challenge Blog / Drunken Stampers Challenge Blog will draw one winner each for a $20 Gift Certificate to the Digi's with Attitude Store too!! All winners will be posted on December 13, 2010 . Winners from each designer’s blog will be posted on their blogs, the 2 main winners will be posted on the Digi’s With Attitude! Challenge Blog and Drunken Stampers Challenge blog respectively. So be sure to retrace your steps to see if you are a winner! We hope to see you at the Office Party! I used the Digi's With Attitude! 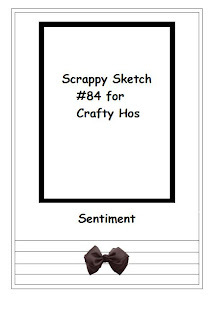 Grumpy Gretchen Salsa image for my card and generated my own sentiment on my computer. Below is a list of the designers in the hop in case you get lost along the way! Digi's With Attitude! 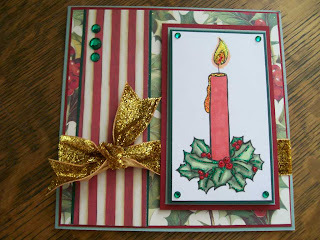 Honorable Mention & Best Card of The Month! I hope you're enjoying yourself at the Office Party! I'm glad you've been here. It's now time to hop on over to Linda's blog to see what she has in store for you! Winter is "Snow" Much Fun! Please NOTE: I have two blog posts today. This one features this week's Chi Chi Memories Challenge. 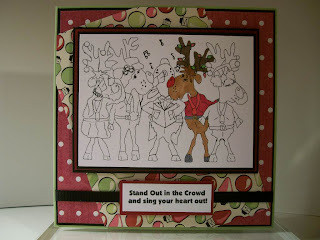 The next post features the ANYTHING GOES challenge at Stamp-n-Doodle. A Brand New Chi Chi Memories Challenge begins today! You really need to check out the Chi Chi Memories Winter Fun set... there are so many adorable images in it that it was difficult to choose just one to use. 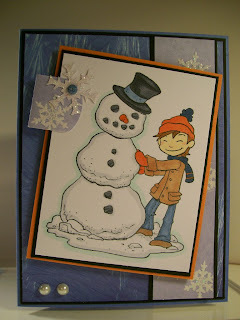 Here are two more pictures, just because I like this snowman "snow" much! Have fun! 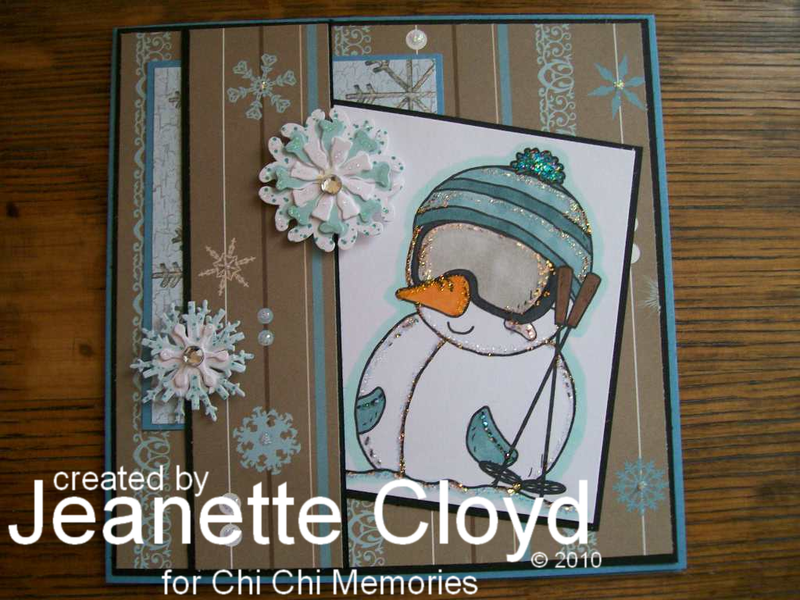 And remember, the Chi Chi Memories challenge is all about winter! 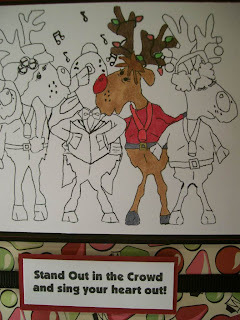 Stand Out In the Crowd! Because I'm now in the Christmas mood - did I mention I have most of my Christmas shopping done and all but one of my 33 Christmas trees up and decorated??? - I wnt with a Christmas-y card! I created the sentiment in a Word document on my computer. Have fun with this ANYTHING GOES challenge! I'm looking forward to seeing your creation!